After an introduction and an introductory chapter that prepare the way for a discussion of “interwar fascism in Europe,” fourteen articles focus on specific countries in three religious groupings: Orthodox Greece, Serbia, Romania Ukraine), Protestant (Britain, Sweden, Germany) and Catholic (Italy, Belgium, Portugal, Austria, Croatia, Ireland, Hungary). The introduction discusses the problematic nature of the term “clerical fascism,” with reference to Luigi Sturzo, Roger Eatwell, Mark Juergensmeyer, Robert Lifton, Mircea Eliade and Hugh Trevor-Roper, and proposes a working definition: “an authoritarian socio-political current, which emerges within clergy holding nationalist views, legitimising and supporting fascistized politics as a means of creating a state, in which religion’s authority, once forfeit, is expected to be revived, bringing order and earthly salvation to the nation” (61). The aim of the article is to present western Ukraine as a case study of this interwar European phenomenon. The next section considers Ukrainian nationalism as a type of fascism – in a few sentences, the nineteenth century and early twentieth century processes are dispensed with and we are taken to 1929 Vienna, where the First Congress of Ukrainian Nationalists formed the OUN. What follows is a survey of this national movement through the prism of its leaders and ideologues – the OUN’s first chief (or vozhd’) Yevhen Konovalets; OUN leader Volodymyr Marynets; the writers Mykola Mikhnovs’kyi and Dmytro Dontsov – neither of whom ever joined the OUN; Mykola Stsibors’kyi, whose 1935 work Natsiokratia outlined organizational principles; Stepan Lenkavs’kyi, author of the “Ten Commandments for the Ukrainian Nationalist”; and Zenon Kossak, whose “Twelve Traits” and Forty-four Rules” developed further on the same theme. The transition of this topic to the religious sphere is made with reference to Dontsov’s 1924 Tserkva i Natsionalizm, which argued that the Catholic Church’s anti-materialism, intolerance and fanaticism imparted nationalism with “theological qualities;” to Maksym Orlyk, whose 1940 Ideia i Chyn Ukrainy argued for religious and national renewal in the face of Bolshevism and materialism; and Stepan Bandera, who we are reminded was the son of a Greek Catholic priest and who wrote in the 1954 article “Ukrains’kyi natsionalizm i relihiia” that Ukrainian nationalism was a Christian movement. Finally, we arrive at the core of the article, “Ukrainian Greek Catholic Church between Conservatism and ‘Clerical Fascism’,” which will lead to the conclusion that while the study of clerical fascism remains at a preliminary stage, the social and political activities of the Ukrainian Greek Catholic Church may be classified according to the attitudes of three groups towards Ukrainian nationalism: clerics who rejected the idea of the nation’s primacy before God and who had a negative view of fascism and Ukrainian nationalism; nationalist clerics, who while lacking direct ties to the OUN felt that it could be exploited for proselytism and “enforced monoconfessionalism;” and “clerical fascists,” who tried to fuse Greek Catholicism and Ukrainian nationalism through a religious notion of revival, and who legitimated violence against Ukraine’s foes. 1. “Many Greek Catholic priests took part in battles on the side of the UHA and USS against the Polish army.” Sheptytsky “blessed the yellow and blue banner of the Sich Shooters.” In this connection, Polish Commander Grabovsky is quoted from a discussion of the 1946 Lviv pseudo-Sobor, describing Sheptytsky as “a politician rather than a priest or a bishop” (65). In fact, priests serving on the battlefront would have been chaplains, not front-line soldiers. The Lviv-pseudo-Sobor, an initiative of the NKVD, was a spectacle designed to “justify” the arrest, deportation and murder of the entire episcopate and the coerced, staged “self-liquidation” of the Ukrainian Greek Catholic Church. 2. “Terrorist actions against Poland by the OUN were condemned by official circles of the UGCC; activities in which, however, it did not internally prohibit the clergy from participating. For example, Polish police arrested 30 Ukrainian clerics for terrorism over only five months in 1930.” The story of the 1930 Polish pacification campaign remains a contested historical issue, with allegations of brutality on both sides. The arrest of clerics or other individuals at this time establishes neither guilt nor specific the nature of allegations. It is not a conclusive example of anything. 3. Bishop Hryhorii Khomyshyn is singled out for his opposition to Ukrainian nationalism, even in its most moderate forms, and his rejection of Ukrainians’ right to call themselves a nation. In the socio-political dynamics of interwar western Ukraine, such “moral heroism” only gave him cause to fear for his life. 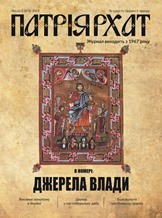 The contrary position, which advocated a synthesis between Ukrainian Catholicism and nationalism, while more predominant, was also a source of divergent views (Ivan Kedryn: “one should choose between fascism and Catholicism,” and Yevhen Onats’kyi: “there is no ground for making such a statement”). 4. In the 1930’s the rhetoric of anti-communism was also a powerful instrument that may have inclined some Greek Catholics to favor a synthesis with nationalism. In this connection, Metropolitan Sheptytsky’s 1936 pastoral letter on Communism is cited with reference to his warnings against collaboration. But there is no mention of his nuanced discussion of Ukrainian communists, or to his earlier reference to the monastery as “a small communist community” (O kvestii sotisial’nii). 5. Sheptytsky’s 1934 condemnation of the OUN’s assassination of Ivan Babii as a criminal act is contrasted with Osyp Nazaruk’s legal representation of an OUN fighter accused of murdering the secretary of the Soviet Consulate in Lviv. Then, this supposed contradiction is elevated to the status of a “double standard” within Ukrainian Catholicism, and the author claims that what we have is “the condemnation of one act of violence and the simultaneous legitimation of another” (67, emphasis mine). The author either does not understand the meaning of a double standard, or he is unaware of the right of an accused to legal defence and a fair trial. The condemnation of violence by the leader of the Church was not compromised by the legal action of a private individual. To associate the two events is absurd. “All laws which are offensive to the laws of God and nature, all the laws which are unjust and harmful for citizens and people, are not obligatory in the context of Catholic doctrine… Ukrainian nationalism must be ready to use all means of fighting against communism, not excluding mass physical extermination, even at the cost of millions of lives.” (67). The first sentence resonated with other known statements of the Metropolitan, but the second was suspect and needed to be verified. The footnote citation is fragmentary, lacks a title and is incorrect: Sheptytsky’s little-known article “Ukrains’kyi Katolyts’kyi Soiuz i polityka,” is found – not in Meta #31, 12 August, 1934 pp. 1–2 – but on the front page of Meta, year II, #14 /56/ (10 April, 1932). The first sentence is indeed found in the article, but not the second. Our author concludes that the UGCC demonized communism and called for violence against it. Sheptytsky’s critique of Stalinist Bolshevism was elaborated at length in his 1936 pastoral letter Ostoroha pered zahrozoiu Komunizmu and consisted of three parts: it was a form of militant atheism that was bent on the destruction of the Church – as such, it was incompatible with Christianity; its state capitalism led to collectivization of land and a war on peasants – as such, it was impervious to social justice; its genocidal program was aimed at erasing the Ukrainian people from the face of the earth – as such it excluded legitimate efforts at self-determination. While he did refer to that genocidal intent as “diabolical,” Sheptytsky adamantly insisted that Christians meet the challenge as Christians – violence was not an option. The author refrains from placing specific individuals into one or another of the three proposed camps, so one is left only with constructed theses, implied associations and generalization. While a few Greek Catholics were staunch opponents of nationalism, the Church as a whole probably did demonstrate different levels of commitment to nationalism. But the suggestion that the entire Church was mobilized around an idea of violent opposition to communism is not borne out by the evidence.